Bonhoeffer in 1939. 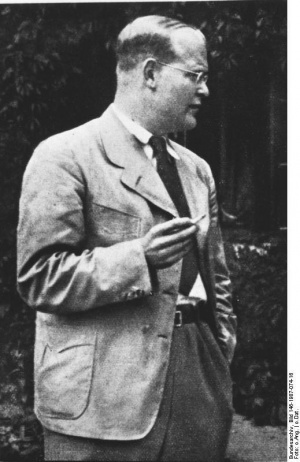 Source: [http://commons.wikimedia.org/wiki/File:Bundesarchiv_Bild_146-1987-074-16,_Dietrich_Bonhoeffer.jpg Wikimedia Commons]. Dietrich Bonhoeffer (4 February 1906-9 April 1945), made a profound impact upon Mennonite life and thought. Although in later life he participated in violent resistance against Hitler, the English translation of his book, Nachfolge (first published in German in 1937; translated as The Cost of Discipleship, 1949), was used as a text in Harold S. Bender's class on discipleship at Goshen College and Goshen College Biblical Seminary for many years. It helped to make discipleship the key term used to describe Anabaptist piety. Together with Johannes Kühn he gave the impetus, more than any Anabaptist sources, to Bender's formulation of the Anabaptist Vision. (Yet Kühn, not Bonhoeffer, was included in Mennonite Encyclopedia I-IV). No doubt others, e.g., Robert Friedmann, whose interest in Kühn was strong, also had an impact on the formulation of the Anabaptist Vision (Gross, "Recasting," 358-59). Allusions and quotes from the Bonhoeffer book appear in Harold Bender's sermons and speeches, and, through Bender's gifted teaching, the life and words of Bonhoeffer inspired several generations of students. From the 1960s on courses on discipleship and on Bonhoeffer himself have been offered at the Mennonite seminaries in Elkhart and Fresno. As the facts of Bonhoeffer's life became better known, a critical engagement with Bonhoeffer took place, with at least two Mennonite doctoral dissertations on him (by A. J. Klassen and Leroy Friesen). Extensive attention was given to his interpretation of the Sermon on the Mount, e.g., by Clarence Bauman, who devotes more space to Bonhoeffer than to any other single individual. Factors that made Bonhoeffer attractive to Mennonites were his concern with the church, the way in which he sought to apply the costly aspects of the gospel in a time of "cheap grace," and, perhaps above all, the concern that he had with making the words of Jesus apply to life here and now. Once the "whole" Bonhoeffer emerged, it was not possible to appropriate his ethical complexity, but there is no doubt that the direct simplicity of The Cost of Discipleship and, above all, the profundity of Life Together made a deep and wholesome contribution to Mennonite church life. The most difficult aspect of his position was the devotion he showed to the Volk concept (Bauman, 265-66). It seemed as if his devotion to his Volk led to an attenuation of his allegiance to Christ as Lord, when he plotted the death of Hitler. Such an act is clearly always in fundamental conflict with Mennonite faith in the lordship of Christ, who calls to a life of love and self-sacrifice. As Bonhoeffer himself said: "When Jesus bids a man come and follow him he bids him come and die" (not kill). Mennonites have had their temptations in this regard, and Bonhoeffer has helped Mennonites to recover the ideal that following Christ means saying farewell to other attachments." Bethge, Eberhard. Dietrich Bonhoeffer, trans. E. Robertson and others. Evanston: Harper and Row, 1970. Bauman, Clarence. The Sermon on the Mount: the modern quest for it meaning. Macon, Ga. : Mercer U. Press, 1985: 249-74. Gross, Leonard. "Recasting the Anabaptist Vision: the longer view," Mennonite Quarterly Review 60 (1986): 352-63. Kühn, Johannes. Toleranz und Offenbarung. Leipzig, 1923. Visit the major Dietrich Bonhoeffer web site. Klassen, William. "Bonhoeffer, Dietrich (1906-1945)." Global Anabaptist Mennonite Encyclopedia Online. 1989. Web. 20 Apr 2019. http://gameo.org/index.php?title=Bonhoeffer,_Dietrich_(1906-1945)&oldid=143383. Klassen, William. (1989). Bonhoeffer, Dietrich (1906-1945). Global Anabaptist Mennonite Encyclopedia Online. Retrieved 20 April 2019, from http://gameo.org/index.php?title=Bonhoeffer,_Dietrich_(1906-1945)&oldid=143383. Adapted by permission of Herald Press, Harrisonburg, Virginia, from Mennonite Encyclopedia, Vol. 5, pp. 92-93. All rights reserved.